It is full of high grade toys, premiums, models, cells, artwork, and so much more. There is a strong emphasis on the monster and superhero collectibles, but full of neat premiums and artwork as well. So check back often or add me to your favorites so you don't miss anything!! John Watson has become one of the hottest cover artist in the comics world today. His paintings are realistic, vibrant, desirable, and have even been compared to the likes of Alex Ross. I will be listing a number of his paintings and pencils, so check them out! 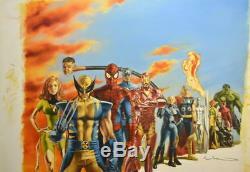 The painting features Marvels greatest heroes - Wolverine, Phoenix, Spiderman, Iron Man, Captain America, Invisible Girl, Mr. Fantastic, Thor, Silver Surfer, Vision, Prof.	Xavier, Daredevil, Hulk, and the Human Torch. The canvas size is 23 1/2" x 31 1/2". The painting area is 20" x 25". Canvas and painting are in great condition. 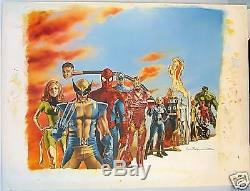 The item "WATSON ORIGINAL PAINTING MARVEL ENCYCLOPEDIA HEROES" is in sale since Wednesday, September 02, 2009. This item is in the category "Collectibles\Comics\Original Comic Art\Paintings". The seller is "masteraddams" and is located in Hatfield, Arkansas. This item can be shipped worldwide.